I was challenged to improve my students’ vocabulary and sight word recognition with one iPad in the Fall of 2011. My students were amazingly successful and we only used 4 skill building apps. This minor success developed into a written proposal for 20 more iPads, a MacBook and an iPad cart. Our proposal was fulfilled and we received all of the technology in May of 2012. Skill building has developed into knowledge building through the use of applications on the iPad that harness the power of creation, communication, collaboration and motivation. My multidisciplinary approach in the use of the iPads has led to the demonstration of student growth in Literacy, in Math, and in Digital Literacy. The use of applications such as Show Me, Draw and Tell, iMovie, and Explain Everything has been our content creator. Student directed blogging, Youtube and Twitter have been our marketing campaign where we have celebrated our learning globally. I am very excited about the results I have seen and the knowledge I have gained. Out of 21 students, I have 10 students at least one year above their reading level for their age, 7 students reading at grade level and 4 who are well on their way. Students in my class are excited to write because they now have the excitement of an authentic audience. My students’ favorite question is, “Can we embed this onto our blogs when we are finished?” Yes! My grade one students actually say “embed!” We are continually looking for different apps to use to publish their writing. 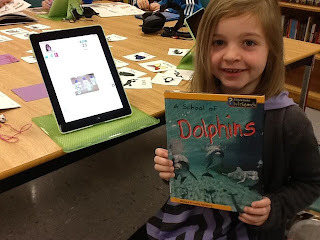 We have used Scribblepress, Book Creator, Book Buddy, Explain Everthing, iMovie, LittleBirdTales, PuppetPals, Kidblog and Toontastic to publish their writing. Can you imagine having these choices as a student? At the beginning of the year, I had many reluctant writers, now, my students are excited to write and always ask for more time to complete their writing. Incorporating the iPads into their math stations have provided them with an important visualization and manipulation tool that relieves anxiety and improves engagement. Students are showing their learning by answering math problems using content creation apps. These apps record problem-solving solutions, and are shared with peers for analysis and growth. My students benefit from learning from peers more than when I am instructing. During my math lessons, students are actively using the apps and displaying their math strategies using the Apple TV. This also helps me give instant feedback to my students. I act as a facilitator and their leader. Aside from the benefits my students have gained, I have been granted additional benefits for myself as an educator. I have found applications for the iPad (Evernote, Audio Boo) that have been able to augment my assessment and evaluation of students at an entirely new level. Now included in my anecdotal notes are photographs of student work, audio recording of students reading and video of student presentations. These tools enable my students to pause, rewind and replay their learning in order to identify errors and comment on their work, and for me to be able to give them authentic feedback. Much of what is documented is shared via students’ blogs and parents then participate in the celebration of learning successes. What started as the success of making a one iPad classroom work has turned my classroom to a knowledge building environment where my 6 and 7 year olds are in charge of their own learning.